The 4-story circular building, which Steve Jobs famously described as "like a spaceship," encompasses more than 2.8 million square feet and is designed to house upwards of 12,000 employees. It's been more than two years since Apple announced plans to build a new "spaceship" campus in Cupertino, Calif., and today, the Internet has been treated to a first look at a 3D model of Apple's proposed new "spaceship" headquarters. 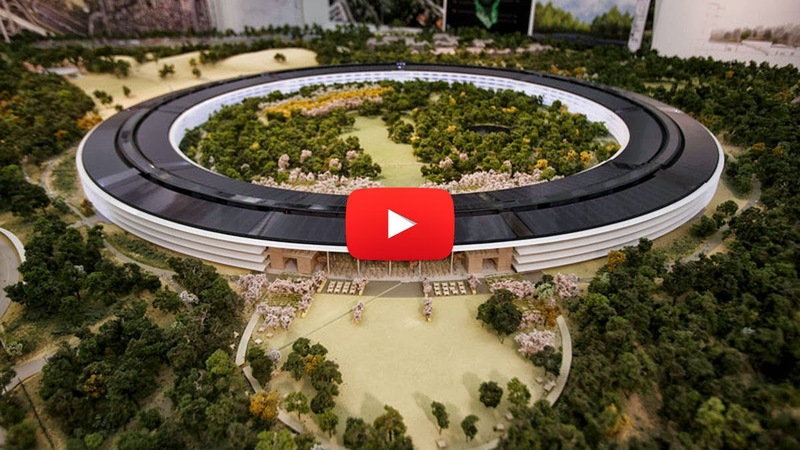 The San Jose Mercury News was given a sneak peek of a model of Apple's new proposed campus before it goes before the Cupertino City Council on Tuesday. The committee will have to vote on the project before any construction begins. The Mercury News posted a Tout video that gets up close with the huge model. Check it out below. Apple is known for its design experimentation, especially with large pieces of glass. Late founder Steve Jobs first announced the company’s expansion plans at a Cupertino town hall meeting in June 2011: "It's a little like a spaceship landed," he said. "We’ve used our experience making retail buildings all over the world now, and we know how to make the biggest pieces of glass in the world for architectural use." What do you think of the model? Let us know in the comments below.